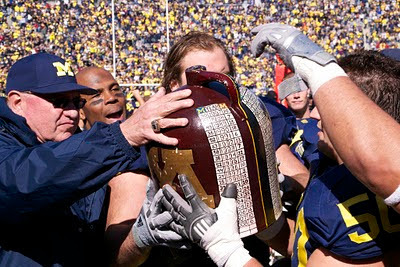 The Jug remains in good hands. MVictors brings you a few awesome posts, Jug related, Shut-out preserving related, and more Jug related. MGoBlog brings you a full recap, post-game presser transcripts - Hoke, players, and video of all varieties. Post-game editorials from Hoover Street Rag, The Wolverine Blog, Big House Blog. Geoff from HSR says his piece on the tragic loss of MMB trumpeter Patrick Fleming, who was killed in a traffic accident last week. I'd be remiss if I didn't at least mention the epic failure that is the Ohio State offense. They looked absolutely awful against a tough Sparty defense. But I think the MZone (who else?) offers up the best headline and take on this game. First up on the video front, highlights-a-plenty. The full 45-minute post-game presser. Can we find fault in a 58-0 win? Probably, but I don't like to dwell on mistakes. You can point to kickoff coverage, some pass interference and holding penalties, giving up a couple run plays over 20 yards, but overall this was a pretty great game for Michigan in all aspects. We looked really sharp on both sides of the ball. Denard threw eleven completions before his first incompletion, which is exactly what Borges had in mind with his play-calling early in the game. This game was all about building confidence for the parts of the offense that have struggled...namely the passing game and the running backs. I made a comment on Twitter early in the game about the wrap on Denard's right arm, which is what Hoke and Denard in the post-game presser were calling a "boo boo" -- much to the frustration of the assembled media. I said that the wrap was covering up where the Michigan coaches had enabled Denard's "passing mode". It certainly seemed so in this game. He looked sharp -- in a stiff breeze no less. Denard finished 15/19 for 169 yards and 2 TDs. No sacks, no INTs. He also added 6 carries for 51 yards and another touchdown. Leading the way on the ground was Fitz with 11 carries for 108 yards and a TD. Thomas Rawls added 10 carries for 74 yards and his first Michigan TD during cleanup duty. And Michael Shaw was the 3rd leading rusher with 61 yards over 8 carries. I don't have the full stat book in front of me, but I can't remember when Denard wasn't a top-3 leading rusher in a game? I really really really enjoyed the play-calling by Al Borges. Adding Devin Gardner to the mix early and often was a genius move. Not only does it make Michigan even tougher to game plan for, but it shows the remaining 7 teams on our schedule that we have two very capable and athletic quarterbacks that can be on the field at the same time. Very dangerous to defend against. On the other side of the ball, it was a step forward yet again. Now, I'll admit that Minnesota was pretty bad. They had a true-freshman QB making his first start, and it showed. But that doesn't mean they're, by default, not worth playing tough against. Michigan put their boot on the throat of the Minnesota offense and never let up...even when the bulk of the starters left the game. Things will get tougher this week as Michigan heads out on the road for the first time this year. Evanston at night is not something I'm really looking to, but it should be a good test for this team before we head to East Lansing the following week.